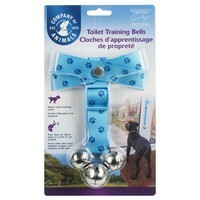 Company of Animals Toilet Training Bells are a simple solution to aid in the daunting task of toilet training your dog. Easily adjustable in length to accommodate different sizes of dogs and doors, the Toilet Training Bells can be hung on any door handle and are used to essentially teach your dog to ring the bell when they need to go to the toilet. Simple to use, the bells come complete with a full step by step guide to provide all the information you need to train your new dog or puppy.